2015 began (as always) with a reflection of what went down the previous year. But now was the time to embark on the last gigantic year of Hunger Games promotion leading up to the release of the final film. The Hunger Games: Mockingjay Part 1 was still packing in the numbers at the box office and that was with a release in China still to come. Awards season was gathering steam again; Jennifer Lawrence cleaned up at the People’s Choice Awards, Julianne Moore won the Golden Globe and was nominated for Best Actress at the Oscars. After the blacklash that ensued after the dance remix of ‘The Hanging Tree’ released a couple of months previously, Republic Records released a new alternative radio mix that at least attempted to place the song somewhere around District 12. Tim Palen’s book ‘Photographs From The Hunger Games’ was announced with a release date set for June. A new trailer for the Mockingjay Part 1 Blu-Ray/DVD hit the web with a later confirmation date for a March release. The Hunger Games: Mockingjay Part 1 ended its theatrical run as thehighest-grossing film of 2014 in the US. MTV’s Movie Brawl kick-started again, Mockingjay Part 2 reached the final and won. February began with a pulled-out-of-thin-air rumour that Mockingjay Part 2 would be one minute shorter than Catching Fire. ‘The Hanging Tree’ by James Newton Howard went Platinum and here at Jabberjays.net we continued to JabberCast, wrote editorials on the future of Hunger Games and sent out another District Debriefing to readers. With the Blu-Ray release just one month away, we learnt details of the deleted scenes included. It was announced that Mockingjay Part 2 would have an IMAX 3D release and The Hunger Games: The Exhibition would open in New York in the summer. A Japanese trailer for Mockingjay Part 1 landed and clips from the Blu-Ray Special Features started to trickle out. We saw Finnick almost in his underwear, Natalie Dormer getting her Cressida haircut, Jennifer Lawrence on wearing Cinna’s designs and also scaring everyone while filming hovercraft scenes. We had deleted scenes of Katniss in the make-up chair and Haymitch and Katniss discussing Peeta. The first 3 minutes of Mockingjay Part 1 were available to watch and more and more behind the scenes clips were released from the special features. A new message from President Snow told us to tweet #UnlockMockingjay yet again to watch a deleted scene between Snow and Peeta. More clips from behind the scenes showed District 12 and Peeta’s rescue mission. Finally opening in China, Mockingjay Part 1 surpassed Catching Fire‘s total box office in just one week! Julianne Moore won Best Actress at the Academy Awards adding another Oscar Winner to the cast. Josh Hutcherson confirmed that there was one final scene to be shot in the summer for Mockingjay Part 2 and pre-registration for The Hunger Games: The Exhibition was open. Katniss’ favourite time of year, spring, arrived and brought with it the intriguing rumour that a teaser trailer for Mockingjay Part 2 would appear on March 20th. It was Part 1 Blu-Ray/DVD release month and we gave away a copy and other goodies (’cause we’re nice like that) and more behind the scenes featurettes were released, Unbreakable Bonds and Crafting Weapons. Mockingjay Part 1 was nominated for four MTV Movie Awards and Lionsgate signed a deal with Disney to distribute Part 2 in Russia and Eastern Europe. Mockingjay Part 1 was toppled by American Sniper as the highest-grossing film in the US of 2014 (thanks Issi) and then those teaser trailer rumours really started to pick up steam. We learnt that a logo would play in front of Insurgent and then we discovered the trailer would be called ‘Remember.’ Out came ‘Remember’ along with the teaser poster and, on the exact same day, we heard that a teaser trailer was due to appear alongside Avengers: Age of Ultron… which it then didn’t. We tried to assuage crushed fan hearts with a video edit of the story of Katniss and Peeta so far. In a display of impeccable taste (Johanna-levels of sarcasm) Lionsgate announced plans for a Hunger Games attraction at a theme park in Dubai. We rounded out March with another JabberCast to discuss the logo reveal and speculate what levels of marketing we could expect… any day now. A sponsorship for social media website, Vine, was going to be tattooed on the side of Cressida’s hair and Gale was going to go blond by the end of Part 2… jokes! April Fool’s Day of course, when will you learn? The Hunger Games: The Exhibition was under construction, the digital marketing campaign for Mockingjay Part 1 was nominated for a Webby Award and the film won two MTV Movie Awards. Tickets for The Exhibition went on sale and Francis Lawrence spilled the beans on the as-yet-unfilmed Epilogue, the current cut from 3 hours to just over 2 hours, the upcoming Comic-Con and how he had no idea when a trailer would be released. 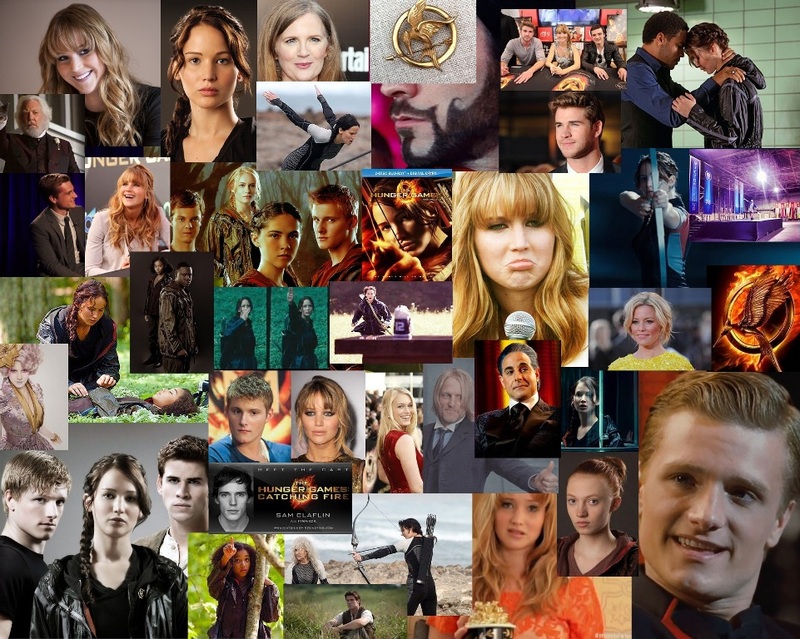 By 2015, The Hunger Games had become entrenched in pop culture, far outstretching the original fandom of the novels. Suzanne Collins’ whip-smart satire of our world and media in her depiction of the Capitol was now a part of collective consciousness and a common source of societal parody such as in The Daily Show with Jon Stewart. All bright and hopeful in March soon turned in to an ‘Age of Ranting’ on JabberCast as we lamented that the fans had nothing new to feed off. We had unconfirmed sources that the Epilogue was scheduled to be shot in early June. From Cannes, there was a commemorative print of Katniss and Prim and a portrait of Effie from Tim Palen’s book. There was also… the… well, there was news that… or the time they released a… OK! Nothing else happened in May! It was the biggest drought of Hunger Games news since before Jennifer Lawrence was cast as Katniss in early 2011. We all ran around the Jabberjays.net office wondering what to post and praying the silence would end soon. A new website was launched, Revolution.pn, calling for Rebel registration that included a wonderful poster of Snow’s marble-like figure and throne smashed with Mockingjay graffiti behind it. A new Part 2 still was released along with news that something would be coming our way on June 9th. Another still arrived showing Peeta in Rebel gear, the always lovely Nina Jacobson tweeted a photo from the set of the Epilogue and we all tried to decipher what we were actually looking at in the photo. A locked teaser trailer called ‘Unite’ arrived in US theatre chains, we got a still of Gale in the sewers and Nina Jacobson confirmed that the trailer would indeed be released on the 9th. We knew that the final day of Hunger Games filming was upon us on the 7th and then the news came through that the production had officially wrapped in Atlanta. It was a day of mixed emotions. We tried to carry on and made predictions for the ‘Unite’ trailer, then finally we were able to watch it and you flocked in your hundreds to discuss it with us! Another website called TheHungerGames.Movie was launched, we JabberCasted about the brand new trailer, that killer line: “Welcome to the 76th Hunger Games,” and even recorded a few of our reactions. Lionsgate announced that the 3D release of Part 2 was canceled in the US but confirmed that there would be a Mockingjay Part 2 panel in Hall H at San Diego Comic-Con. Mockingjay Part 1 won four Teen Choice Awards and we got our first look at The Hunger Games: The Exhibition. ‘Unite’ billboards started popping up and a new trailer was shown to exhibitors at CineEurope. The Hall H panel was scheduled for July 9th, Jabberjays.net had an exclusive look around The Exhibition in New York (which included artwork from our very own Jabberjay, Cory) and Jennifer, Josh and Francis helped to launch Tim Palen’s book. The main cast and crew were confirmed to be attending San Diego Comic-Con the following month and Jennifer, Josh and Liam Hemsworth would appear on a special episode of Conan from the convention. The Exhibition was announced to be heading for San Francisco after New York; Jennifer, Josh and Willow Shields toured around the exhibit and Jabberjay Grant gave a fuller review of how much he enjoyed it. We were blown away by the announcement last year that Katniss would tread the boards in London; the 2016 play adapted from The Hunger Games by Suzanne Collins now had a title: The Hunger Games StageAround. More portraits from Palen’s book started to trickle out and then actual Part 2 stills started to appear. We saw Effie and Katniss in front of a mirror and Boggs leading Katniss and Squad 451. Eight new character posters showed Katniss, Peeta, Gale, Finnick, Johanna, Prim, Cressida and Boggs with Mockingjay war paint on their faces and we taught you how to make your own war paint poster. A new video on Snapchat showed Katniss in a red Mockingjay outfit and billowing cape before a brand new poster of Red Mockingjay Katniss sat on Snow’s vacated white throne. At San Diego Comic Con, Francis, Nina, Jennifer, Josh, Liam and Willow headed to Hall H for the Mockingjay Part 2 panel and debuted a brand new trailer, whereas those not in attendance were treated to a propaganda video called ‘Stand With Us,’ which kinda reminded us (and everyone else) of Janet Jackson’s ‘Rhythm Nation’ music video! The gang also gave away more details from Part 2 at the press conference after the panel. Willow, Natalie, Elden Henson, Wes Chatham, Evan Ross and Gwendoline Christie stopped by the Lionsgate booth to sign posters as Jennifer, Josh and Liam sat down for a special episode of Conan (1,2). The Hunger Games won MTV’s Fandom of the Year award. Naturally, because you’re all pretty rad! After a long period of next to no news we were gifted with several press interviews from SDCC featuring our favourite triumvirate (1,2,3,4,5,6,7). Despite the lock down on footage, we heard detailed reports of what was included in the new trailer; eventually audio of it was leaked and revealed a lot of new dialogue. Despite a crowded schedule of exciting new films at the convention including Batman V Superman and Star Wars; Mockingjay Part 2 was the most tweeted about movie at San Diego Comic Con. We had to wait a couple more weeks until the trailer was posted on the internet but in the mean time The Hunger Games: The Exhibition online store was opened. A preview of the trailer was released, a countdown began and then finally July ended with the release of the theatrical trailer. A new still and concept art popped up in the pages of Entertainment Weekly and Mockingjay Part 1 picked up a few Teen Choice Awards. Mockingjay Part 2 was given a PG-13 certificate from the MPAA and Snapchat was celebrating the 5 year anniversary of Mockingjay by Suzanne Collins. August was (yet another) quiet month for news but saw the release of a banner depicting a toppled statue of President Snow surrounded by Red Mockingjay Katniss and the other members of Squad 451. We began our Panem Pop Quiz and in the wake of, well, nothing since Comic-Con, another ranting episode of JabberCast was on the cards, ‘The Ranting Games!’ We are satisfied sometimes, honest! Jennifer spoke to New York Times along with a new fiery still of Katniss. A couple of days later, however, news started to flood in. A promotional World Tour for The Hunger Games: Mockingjay Part 2 was announced and locations were revealed across the cast and crew’s social networks along with brand new stills from the film. Speaking of the film itself, Liam saw it and was the first to give his thoughts. We learnt that a new trailer was going to debut on GMA and Stephen Colbert likened the presidential candidacy race to the Games, donned a blue wig and gave his best Caesar Flickerman impersonation in a continuing segment on his show. Jennifer uploaded a new poster of Part 2 showing Katniss with a mockingjay on her shoulder and a new trailer was released called ‘For Prim.’ New stills arrived including Coin in a gold room and Scholastic UK published new flaming editions of the novels. Once again Jabberjays.net visited The Exhibition in New York and Carla took pictures of everything… no really, like, everything! We discovered a brand new behind the scenes still of Woody Harrelson in the gold room and fans began to speculate that it might be the room in which the victors vote. Twitter lit up when a photo appeared of a President Snow Funko Pop! and soon enough the rumour was confirmed and Funko announced a line of Hunger Games vinyl figures. In September, excitement for Mockingjay Part 2 eclipsed all other upcoming films and was tracking higher than Star Wars: The Force Awakens. It was reported that the final trailer for the film would debut in Best Buy stores via Samsung the following month including a virtual reality experience. A new badass still of Katniss was published in the pages of Total Film and Assouline were going to release an Ultimate Edition of Tim Palen’s book costing over $800. 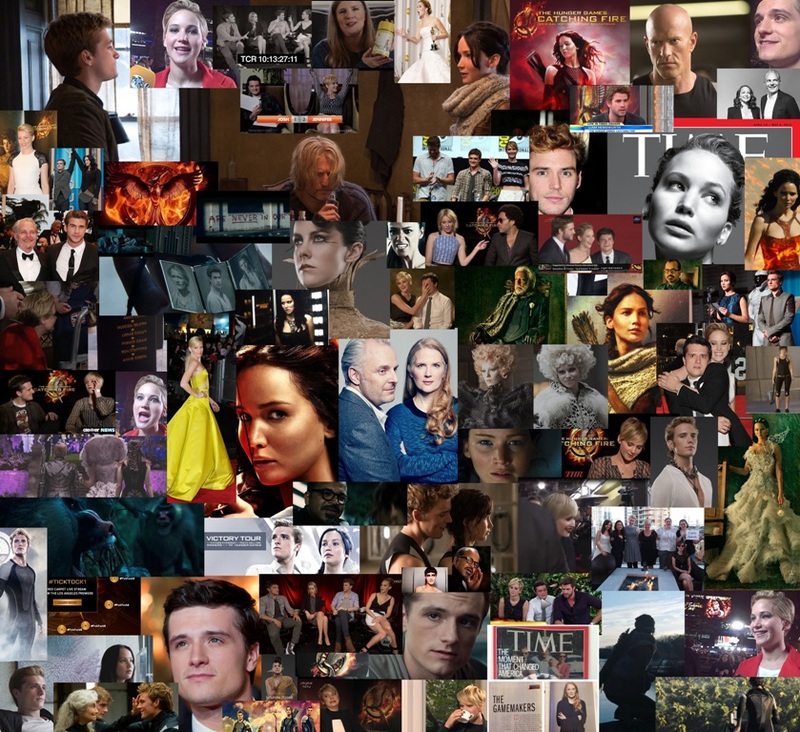 The finalists for ‘The Hunger Games Tribute’ were compiled from the best fan-created content, and Jen, Josh and Liam encouraged fans to vote for their favourites. A host of new stills surfaced, AMC theatres gave a running time of 2 hours and 16 minutes and the virtual reality experience with Samsung Gear VR would include a moment from Mockingjay Part 2. September ended with the release of the final poster for the series showing Katniss in flight and taking aim. Tickets officially went on sale for The Hunger Games: Mockingjay Part 2. More and more stills arose including Peeta in the gold room, all but confirming it to be from the victor voting scene. Entertainment Weekly released an exclusive issue with new pictures and interviews; Jennifer, Josh and Liam camped out with Josh Horowitz on MTV and fought about Beyonce with Fandango. Excitement began to peak as the first clip from the film was released showing the members and purpose of Star Squad 451. We talked about ‘The Exclusive Revolution’ and heard a very odd (and untrue) rumour that Part 2’s running time was longer than previously reported. Francis tweeted that The Hunger Games: Mockingjay Part 2 was officially completed and ready for print and distribution. Finally the trailer was released online for the many who couldn’t get to Best Buy to watch it and we kindly provided over 450 screencaps for you all to mull over. The new stills kept coming and a stunning IMAX poster was released for the film. We got a new promo image of Katniss on the cover of SFX and Jena Malone tried on the VR head gear. Mockingjay Part 2 would open in China on November 20th like the rest of the world and Jennifer wrote an influential and often-cited essay on the gender pay gap in Hollywood. Hallowe’en was fast approaching and we ran our costume and dubsmash contest to celebrate. Lionsgate adopted the new Twitter poll system to ask fans to vote for which character still they would like to see, giving us new pictures every day of Messalla, Finnick, Coin, Prim in Rebel medic gear, Haymitch and Pollux. As well as the already announced premiere dates, Beijing, China was added as a stop on the World Tour. Francis got every fan heart beating when he mentioned that toward the end of the film there was a “surprise that wasn’t in the book” that apparently fans would get a real kick out of. There were rumours from Atlanta that Lionsgate were planning a Hunger Games theme park in Georgia and stills of Katniss, Peeta and Gale were revealed. News arrived at Jabberjays.net that we would exclusively debut the first TV spots with our fansite friends and the following day we posted two brand new exclusive TV spots, ‘Her Story’ and ‘Final Battle.’ And because we’re extra lovely we also gave away Mockingjay Part 2 tickets from Fandango, provided screencaps for both TV Spots and gave away our exclusive bookmarks. ‘Cause, we like y’all! More stills and the first video of Jennifer, Josh and Liam at the press junket trickled out. Katniss Everdeen dominated magazine covers and articles, along with EW and SFX, there was SciFiNow, Total Film, US Weekly, Empire, Cineplex and a first look at Peeta strapped to his hospital bed talking to Prim from J-14. The last day to vote for the Tribute Awards approached (with our very own franchise trailer nominated) and the cast were due to attend a Global Fan Appreciation event with fans on Hallowe’en. Meanwhile in Canada, a Montreal Metro Car was covered in the war-painted faces of characters from Mockingjay Part 2 giving new meaning to the line: “You never get off this train.” We wouldn’t want to, Haymitch! TV spots starting flying in thick and fast. There was ‘Epic Finale,’ a special preview during the World Series and another called ‘Trailer Cutdown.’ World Tour dates weren’t finalised yet as Josh tweeted that Madrid, Spain was also on the cards. Industry estimates showed that Mockingjay Part 2 was expected to haul in $121.5 million domestic on opening weekend. Here at Jabberjays.net we picked 15 moments in The Hunger Games that gave you chills and Lionsgate UK published the production notes for Part 2 showing the characters that were included in the credits and revealed that Jennifer Lawrence would sing ‘Deep in the Meadow.’ On Hallowe’en, Jennifer, Josh and Liam were honoured and immortalized at Grauman’s Chinese Theatre on the Hollywood Walk of Fame with a hand and footprint ceremony. The kids have come far since 2011. And then Mockingjay Month was upon us! We recorded a new TV spot to kick off November. Francis and Nina discussed new pictures including the “Stay with me”/”Always” still and B-Roll footage showed us even more of Part 2. We had clips of Katniss telling Johanna that she was going to kill Snow and playing Real or Not Real with Peeta, which first debuted on the Teens React series on YouTube. Spoilers were spilling out at a lengthy press conference with Jennifer, Josh, Liam, Francis and Nina after a screening for reporters in LA. We asked what scene you were most looking forward to and more TV spots popped up again. We JabberCasted for the last time before any of us saw it and the first official review hit the web as the World Premiere was being set up in Germany. The gang headed to the press conference in Berlin before hitting the red carpet where Jabberjays.net was ready to ask a few exclusive questions for fans. Next stop was the London premiere where Jabberjays.net was again in attendance, we reviewed the film twice (Sarah’s review, Ciara’s review) and even asked another exclusive question at the press conference the next day. Over the next couple of weeks we kept an eye on the critics’ thoughts (1,2,3,4,5,6) of Mockingjay Part 2 which ranged from high praise to mixed to lamentations that the novel was split into two movies in the first place. The film ended up with 70% on Rotten Tomatoes, the 3rd best critically-speaking of the series. Footage from the Global Fan Appreciation event was released and we gave away a prize pack and Senitype limited edition movie tickets. Clips arrived of Coin and Plutarch and Squad 451 watching Caesar and James Newton Howard’s score was available for pre-order. Hilarious interviews with the cast started piling up: Jennifer, Josh and Liam played Real or Not Real, the 7 second challenge and Jennifer clarified her bathroom habits while in France as the crew headed to the Paris premiere. The trio couldn’t stop laughing (it was challenging and hard), they talked about deleted scenes, filled online dating profiles for their characters and avoided awkward levels of flirting from interviewers. The first whiff of franchising beyond the novels came when Capitol Couture released Victory Tour posters from past Games including District 4’s Mags. The World Tour continued as the cast and crew visited Madrid and Beijing. Meanwhile, stateside, passes for the LA premiere would be made available in a fashion that sounded as though it would be like a rush to the Cornucopia to get one. A TV programme called The Hunger Games: The Phenomenon was broadcast and more TV spots were posted. We JabberCasted with a spoiler-free summation of what Part 2 felt like to watch and gave last thoughts before it opened worldwide. After the shootings in Paris and in commemoration of Mockingjay Part 2 having been shot partially in the city, a press release stated that the Los Angeles premiere would be scaled down and all press interviews were cancelled. Diane Sawyer’s interview with Jennifer Lawrence was released, more TV spots rained down and we finally finished Through the Pages forever! Francis spoke of Suzanne Collins’ hands-on story involvement and Jennifer, Josh and Liam played a hilarious double prank for #PrankItFwd. Estimates predicted the film would make over $285 million on its opening weekend and we opened our discussion post for The Hunger Games: Mockingjay Part 2 so you had a place to discuss and interact the second you saw the film. The cast and crew attended the Los Angeles premiere and the trio dressed in the colours of the French tricolor – Liam in a navy blue suit, Jennifer in a white dress and Josh in a burgundy red suit. Suzanne Collins wrote (highlight!) a beautiful, heartfelt message to all who had worked on bringing the novels so successfully and powerfully to the screen. We could thank the filmmakers all decade for the exceptional job they’ve done with adapting our favourite books. But Suzanne Collins said it all. The cast and crew and Jabberjays.net headed to New York for one last premiere together. One final clip debuted on GMA and Jennifer Lawrence made everyone laugh on Jimmy Fallon. And then… it seemed only yesterday that it was March 2012 and now we were all finally in November 2015. The final film in the series, The Hunger Games: Mockingjay Part 2, was released in theatres and the story of Katniss Everdeen was cinematically complete. We asked what your ranking of The Hunger Games films were as the picture opened to strong overseas box office, broke records in Germany and took in a fair few bucks before it even opened from preview screenings in the US. However, the opening day numbers were $20 million less than early estimates and had a weaker opening day than Part 1. Over the weekend the film had hit no. 1 across the world and hauled in $247 million at the box office. The score tracklist was released, Facebook added animated Hunger Games stickers from all four films and Jennifer celebrated that she could now go to sleep on Conan after travelling the world to promote the final film. No longer impeded by spoilers, Francis, Nina and screenwriter Peter Craig let loose all of the secrets of the adaptation process in an in-depth interview with Buzzfeed. The funny interviews with the trio weren’t finished either. They discussed the epilogue, ‘Deep in the Meadow,’ played Save or Kill and laughed at Jen’s croaky choked voice. The movie was only out three days but you could already pre-order the Blu-Ray/DVD. Hearts sank yet again as a remix of the lullaby, ‘Deep in the Meadow,’ was released [insert your own ‘This is why we can’t have nice things’ meme here]. A Capitol banquet of 49 new stills were dumped all over the internet and we recorded our post-film JabberCast with many fellow fansite friends. Francis talked about Jennifer’s nephews Bear and Theo Lawrence in the Epilogue and Part 2 passed $300 million at the box office. Fun arrived after post-movie blues with the parody ‘Katniss Sure Loves Pita’ and StudioCanal carved Snow’s face on the side of a cliff and blew it up after tweets called for its destruction. A special edition of US Weekly commemorated the entire series with never before seen photos and facts from all four films. We got our first hint of a deleted scene after the release of a TV spot that included extra (and beautifully written) dialogue from Plutarch’s letter and we were also treated to a haunting TV spot with Katniss singing. Evidently Jennifer soon got bored of sleeping again and began promoting new David O. Russell film, Joy. Early concept art showed a Judi Dench Tigris and November ended with Mockingjay Part 2 ruling the Thanksgiving box office. Francis continued his run of in-depth interviews in a lengthy discussion with Forbes. The crumbled statue of Snow on the white throne with the spray-painted Mockingjay symbol was included in Empire’s list of best posters of 2015 and for the third week running, Mockingjay Part 2 was the number one movie in the world. Lionsgate’s Vice Chairman told investors that the series would continue in prequel/spin-off form but, as it stands, with no involvement from Suzanne Collins and thereby no involvement from Nina Jacobson this hardly created anything other than fear or apathy with fans. After an incredible 2015, Jennifer, Nina and Elizabeth Banks were included in The Hollywood Reporter’s Women in Entertainment Power 100 List. Jabberjays, Crystal and Jackson, were judges on The Hunger Games Biggest Fan Awards and we recorded our final JabberCast of the year, ‘Rant Squad 451.’ Ah, some things never change, eh? Ranting is our home! Promising a fun 2016 red carpet award season, Jennifer Lawrence was nominated for a Golden Globe for her performance in Joy and was nominated for a Critic’s Choice award for her performance as Katniss Everdeen. Bringing the series full circle, Mockingjay Part 2 stayed at No. 1 at the box office for a fourth consecutive week replicating what The Hunger Games had done before in 2012. By it’s fifth week in cinemas, it was top of… oh no, wait. A little film called The Force Awakens opened. Jennifer continued promoting Joy right up until Christmas, culminating on New Year’s Eve with an appearance (finally!) on The Graham Norton Show with Eddie Redmayne. It’s always been fun working on this site and with such wonderful and exceptionally funny people for the release of each of the films in this series. But needless to say, you dear reader, are the reason the site even functions. It’s all for you! There is not a way that we can thank each and every one of you enough for your interaction on Jabberjays.net. Thank you for your comments and for sharing your experiences, enthusiasm and (of course) rants with us. The aim was always to give fans a place to go; a place where our lovable geekiness of these exceptionally important stories could find a home. Sometimes it was stressful, involved sleepless nights or was just plain annoying (hello, Through the Pages) but knowing there were fans like you who really appreciated it made everything so much easier. You have all been so kind and, honestly, the sweet comments and compliments you’ve given us, particularly around the release of the last film, have meant the world to each of us. Thank you to every single one of you who reads this… or even those who are skimming it, it doesn’t matter. If you’re on Jabberjays.net you’re part of the family. Thanks for a great 2015. But woah, woah, woah, wait! Where’re you going now? Pfft, you didn’t think just because her film adaptations were complete that thee Katniss Everdeen was going to fade in to obscurity, did you? Didn’t we just say that she’s become part of the collective consciousness? The Hunger Games has become a part of people, part of how they view society now. Come join us for 2016! We’ve got a blu-ray/DVD release, we’ve got a play, we’ve got a theme park and by Collins you know you want to stick around for that ranting episode of JabberCast. Instinct also tells me that this chick, Jennifer Lawrence – the MockingJen (or JabberJen) – won’t be disappearing any time soon. We’ll be jabbering along here just the same if you want to join us. Happy New Year and May the Odds be Ever in Your Favor!